Granja las Ondinas (or Farm of the Fairies) is situated just after the immense urban sprawl of Buenos Aires finally gives way to the vast expanse of the seemingly interminable flatness of the Argentinean pampas. The surrounding agricultural land consists largely of hen-houses and soy fields, and if it were not for the occasional family of four riding a moped on the highway next to Las Ondinas, one could easily mistake the location for a typical scene straight out of the American Mid-West. However, this farm is far from typical or ordinary. It seems to exist between two worlds; the urban and the rural, the modern and the ancient, the celestial and the terrestrial. The land itself measures roughly 40 acres in size and was purchased in 2004 by an older Argentinean couple named Eduardo and Lydia. They had read at great lengths the works of Rudolph Steiner, the founder of biodynamic agriculture, and decided that they had reached a stage of their lives where it was time to put into practice the theories they had come to hold as their own. They sought out a parcel of land that bore the scars and damage from earlier exploitation. What they inherited after deciding upon a location was a piece of property badly degraded from previous usage as a brick factory and later a soy bean farm. Most of the nutrients in the soil had been exhausted and depleted, but their knowledge of biodynamic agriculture had developed in them an appreciation for a type of farming, when approached from a holistic standpoint, that can actually be utilized to heal the land and restore its spirit. They began by planting a wide variety of ornamental trees and sowing a mixture of cereals and grasses, combined with nitrogen fixing legumes, throughout the open areas of the property. 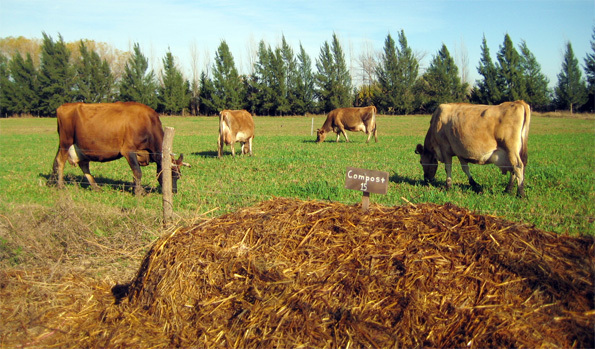 When there was a sufficient amount of suitable pasture crop, they introduced two female jersey cows. 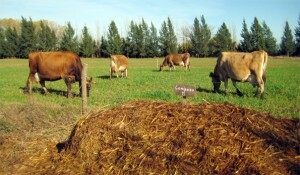 The cow, in biodynamic agriculture, occupies a crucial and central role, both in a practical and spiritual sense. It is believed that the cow harnesses cosmic forces concentrated in the animal’s horns. Both the horns and the manure are employed as essential ingredients in the formulation of incredibly rich compost, the foundation of the vegetable garden Eduardo and Lydia had constructed after the arrival of the first cattle. Fast forward five years to present day and the number of cattle totals 14 (10 females, two bulls, and two calves) and the garden is flourishing. They also have incorporated about 15 pigs, 50 chickens, 80 rabbits, seven turkeys, several goats and sheep and a dozen or so ducks and geese. 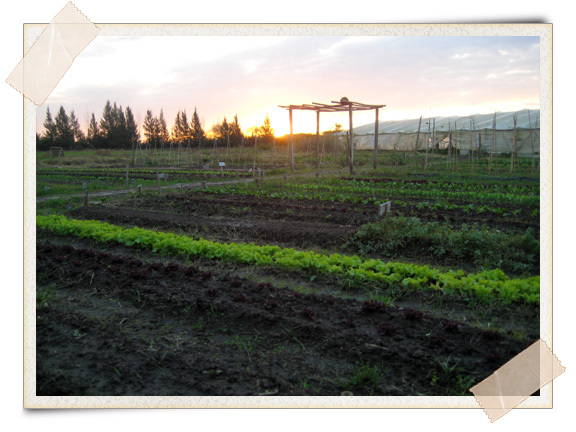 The garden produces a wide array of vegetables year round and several orchards have been established. Open fields on the property consist of mixed alfalfa, cereal and grassland which is rotationally grazed upon according to daily changes. Another hectare is devoted to wheat production (which nets about 4,000 pounds annually) and an acre here or there for corn. Additionally, with 8 dairy cows producing anywhere from 100 liters in the winter months to 130 liters per day in the summer, the construction of a cheese production facility stemmed more from necessity than opportunity. What they have created with all of these elements is a fully functional domesticated ecosystem. 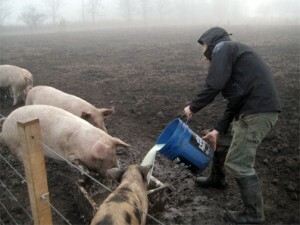 The whey, or by-product from cheese making, is used to feed the pigs, the weeds and grasses from the garden are fed to the rabbits and horses, vegetable scraps nourish the chickens, the goats and sheep eat weeds the cows pass over, pigs eat the weed roots, and the cow manure mixed with phosphate-rich chicken manure cleaned from the stables and pens constitutes the base of the compost that gives life to the plants. The land, only a few years prior devoid of life, now teems with energies existing in a harmonious and complimentary network of checks and balances. Why have we turned something inherently simple, efficient, and effective into a current agricultural system defined by waste, excess and degradation? The answer likely lurks in the commercialization and industrialization of our current means of food production. Eduardo and Lydia made a deliberate and conscious effort to remove the “for-profit” focus at Las Ondinas and convert the farm into a model for self-sufficiency. This required an initial investment on their behalf and sustained financial support they are fortunate enough to be able to provide. As an aging couple they decided to put much of their wealth into a tangible purpose they strongly believed in. Money was certainly necessary to lay the appropriate groundwork, but over the years they have removed the financial component and replaced it with a human one. Lydia says that, “the human being is what makes all of this possible.” They have mostly looked no further that the surrounding local community in search of the human beings that may serve as the engine of the operation. The farm manager is a local man named Juan. Part gaucho, part free spirit and 100% Argentinian, Juan knows a great deal about all aspects of farming (particularly animals) and is passionately outspoken in expressing that knowledge. Another local man has been given managerial duties over the garden. 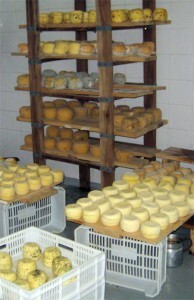 Additionally, two sisters have been hired, one to handle cheese making and the other to cook for everyone at the farm. Other citizens from nearby towns have played various roles in the development and volunteers have come from all across the world. But perhaps the most notable human element is best exemplified in the oversight of the garden, which has been granted to the Ahura Mazda Association, a group in Buenos Aires with ties to Waldorff schools. Under their guidance, they have established one of the first community supported agriculture programs in the city. Every two weeks 15 crates are packed with fresh veggies, eggs, cheeses, and flour (a diverse model that many CSA’s in the U.S. could potentially learn from). The crates are delivered to the door of participating families and proceeds go towards the salary of the garden manager and Waldorff institutions. The association has placed heavy emphasis on the biodynamic system, and planting/harvesting schedules strongly adhere to astrological calendars. Once a month members of the association and the CSA gather at Las Ondinas to prepare compost specially constructed with a grouping of five important herbs believed to impart cosmic energies into the soil. Whether or not these blessings and ceremonies are truly effective may be difficult to prove, but it is hard to argue against the idea that these astrological connections tie the farmer to the historical implications of his or her actions as an ancient rite and instills in that person an elevated sense of purpose. That sentiment stands at the core of what Granja las Ondinas represents. It is built with the idea that plants, animals, and humans exist in balance with one another and each is worthy of respect. This notion might be best captured at Las Ondinas by the classical music played at milking times, but it can be felt throughout all corners of the farm. The fundamental belief remains that agriculture can serve as a healing agent. When that idea is coupled with an aim to bond people and communities, both together with one another, and with the land itself, farming begins to return to its original purpose of strengthening unity between all beings and the natural world from which we all descend. Ross Mittelman was born in Massachusetts and attended the University of Montana where he studied geography and Spanish. Since graduating, he has worked in various fields related to environmental conservation and is currently very interested in the connection it has with agriculture. At this moment, he is traveling throughout South America and working at various farms throughout the continent. Nice article, if you are in Argentina, I would love to meet you. Hi Ross, hope your time in SA last year was grand! 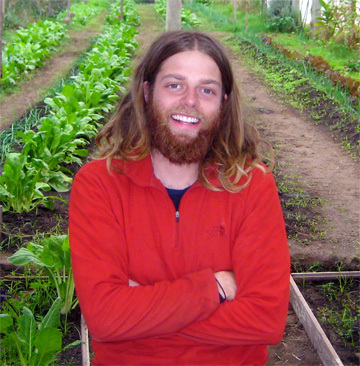 I’m going to be wwoofing in a couple of months in Argentina and wanted to know if you could recommend any farms. I have the list of all the different farms but it’s kind of overwhelming. I was hoping to get some info from people that have already been. Did you go to El Bolson? I’m interested in going there if at all possible.